Hello there how are you? I feel a bit sad today watching the news and hearing all about the riots happening in our country. If you are in the middle of these please keep safe and lets hope our wonderful police force will put a stop to it soon. I wanted to use the Scallop circle die and initially envisaged a round card but I changed my mind and settled on a twisted easel card. I have swapped my colours and cut 12 circles before I finally decided on this LOL. 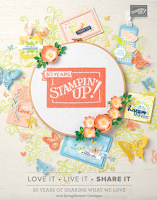 The Sew Lovely (Sew Sweet) stamp set can be found in Stampin’Up! 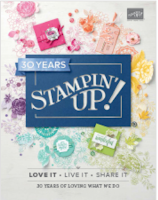 s Mini Catalogue and I have used it a lot so far, is trendy and suitable for more than just sewing friends. I paper pieced the manikins using the wonderful designer paper stack and chose the dotty side surprise , surprise . The measuring tape stamp has been stamped straight onto some daffodil delight grosgrain ribbon for a fun element and small flowers have been punched out using the itty bitty punch pack. I have a video tutorial for the twisted Easel card HERE if you have not seen one of these yet or would like to make one yourself. Sew Fabulous, good luck with so shelli! Świetna karteczka, super pomysł zwłaszcza podoba mi się taśma krawiecka i manekiny. Lovin this Monica-fab colour combo. The ribbon treatment you used is just Fabulous!! Made me (almost) miss my sewing days!! Stunning card!! I so (sew?) wish I had purchased this set now!!!! Have to say Monica you rose to the challenge with style. Beautiful. I absolutely LOVE the idea of the measuring tape stamped onto ribbon! Another wonderful inspiration.